When you mention swing music it tends to conjure up certain images in your head. We don’t often think of acoustic swing. We think of swing bands or big bands. The emphasis is often on the ‘big’ too. We think of something that is spectacular. Something grand – even grandiose – often springs to mind. Depending on the party or event you are planning, something of that scale might be exactly what you are looking for. You might want a big band sound to match a big occasion. But big isn’t always better, is it? Something of this scale might not always be appropriate either. For starters, some venues have noise restrictions. Some have decibel limiters. For smaller venues, the logistics of trying to accommodate a large band, with mics, amps and sound systems in tow might not be practical. It could end up being a big headache – especially for the event organiser. You might want your wedding, party or event to be more of an intimate occasion anyway. Or you might just be planning a smaller gathering. You might want the music at the event to provide an ambient background and backdrop to proceedings. You might not want a full in-your-face live band. Well, if swing’s your thing, why not consider an acoustic swing band for hire? Silk Street Swing is available for hire with a variety of different line-ups. This means it is easy to choose the option that is best suited to your needs for an event. If you want a sound that is smooth, slick and seductive then there is no better instrument than the saxophone. The Silk Street solo saxophonist can perform a mix of Latin favourites, cool jazz melodies and acoustic swing. 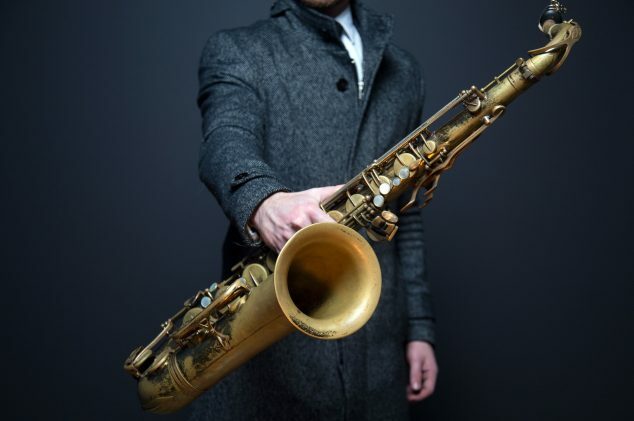 The sound of the sax is sure to create an atmosphere of pure sophistication for your event. A 2-piece line-up offers you another great acoustic swing option. A compact duo is ideal to play in small and intimate performance spaces. A saxophone and double bass duo is a great choice of instruments. The Jazz Two can play a blend of swing, soul and subtle background jazz. These are the sounds that are a superb complement for more intimate occasions, such as a wedding reception or a product launch. Silk Street Swing really can meet your every need. Yes, if you want big, we can give you BIG! Larger line-up options will give you a swing sound that will fill any room. From full cabaret-style to cosy and intimate, we can do it all. You choose just how much you want to scale down the sound. A trio, for example, will give an ambience that is ideally suited for when guests are mingling and munching on canapés or sipping champagne. If you are planning an event then nothing will make it swing like live music does. Acoustic swing is a great choice for a wide variety of occasions, from champagne receptions to parties in restaurants. Get in touch today to find how we can help your event truly swing.